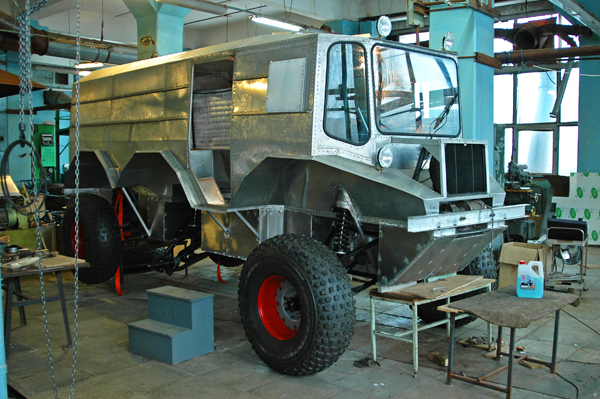 designed for transportation over ice floes and thin ice of the Arctic Ocean. 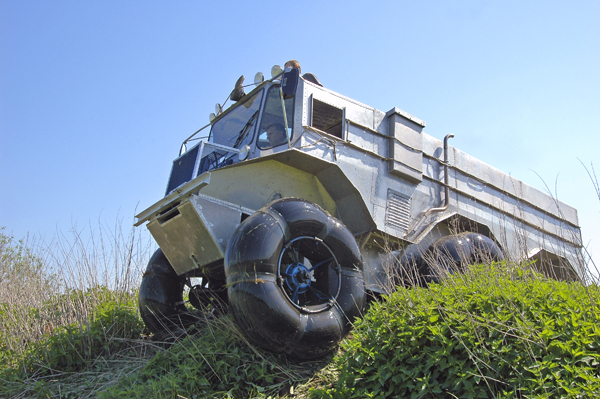 Its six wheels are dressed with special low pressure tires inflated to the mere 0.7 bar. 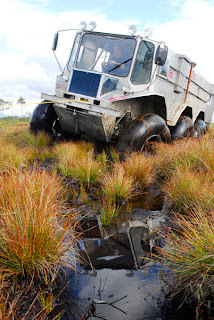 The gross vehicle weight is under 1,5 tons while the total water displacement of the six inflated tires constitutes 5 tons resulting in the very shallow draft of the vehicle body in water - just 10 centimeters. 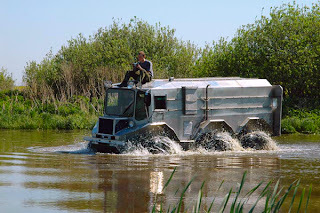 Despite the large profile and windage characteristics of vehicle’s body, its spinning wheels are capable of propelling it at the speed of 2-3 km/h on the open water. 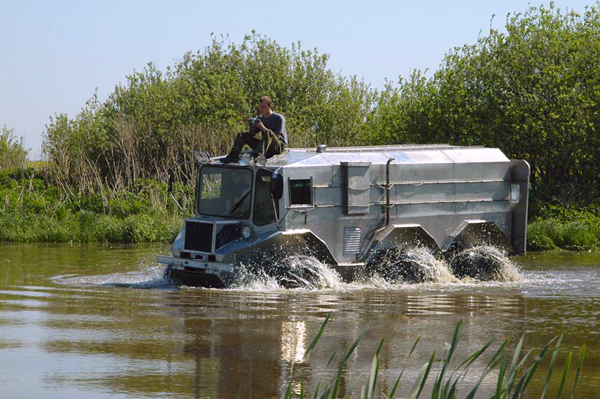 The vehicle tows two single-axel trailers each loaded with 200 L fuel barrel and six plastic containers for food and gear. 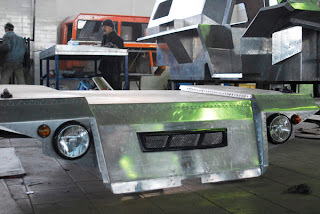 Inside of its aluminum body, which also performs the function of vehicle’s frame, “Yemelya’s” drive train uses an engine from a Toyota front wheel driven passenger car for its powerhouse. Two driveshafts of the engine deliver torque to the locking differentials of the front and middle axles. The rear differential can also be locked and is driven by chain drive and a driveshaft from the middle axle. Driveshafts of all wheels have through-body construction and use seals at the entry points. The engine, transmission and the electrical components of the drive train are all located completely on the inside of the sealed, watertight body, allowing “Yemelya” to feel quite comfortable in salty sea waters. 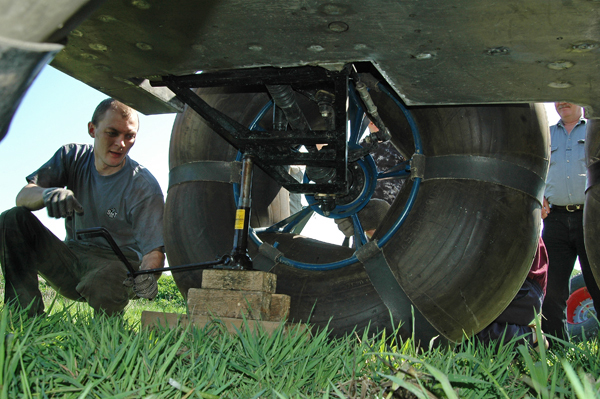 Wheel drums are mounted on separate levers of vehicle’s independent suspension with a free travel of 450 mm. 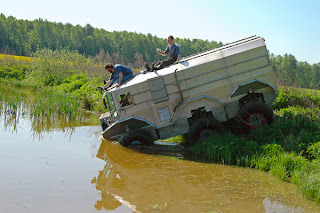 Mechanical winch in the front of “Yemelya” is driven by the main engine power through a separate clutch mechanism. Mechanical winch design is the most reliable and it is not susceptible to overheating and ice build up inside of its components resulting from condensation of water vapors, common with the electric winches. 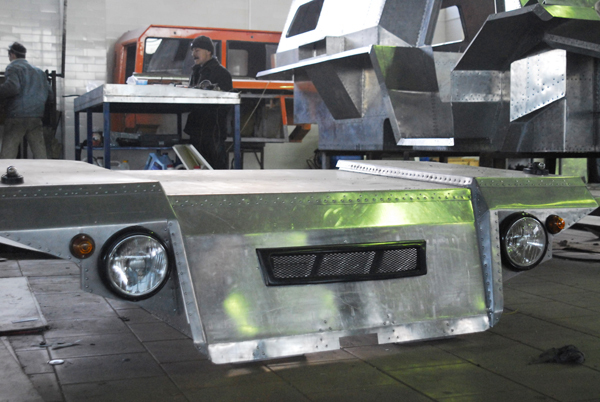 Battery terminals are extended to the outside of the vehicle’s body allowing them to be connected in-line for welding. Snow melting containers are located in specially designed pockets near muffler of the exhaust system. On the inside, “Yemelya” is a spacious, well insulated transport capable of accommodating Arctic travelers for extended periods of time with safety and comfort.